Making it easy to compare real-time pricing and availability, our Shopping catalog contains over 250,000 products with complete data sheets. This system offers the most flexibility in that "multiple-sourcing" is built in providing I/T buyers and managers one place to source products faster and secure (SSL3) at the best price on every order. Your on-line catalog is open for business 24 hours–a-day, 7 days a-week. Your Help-Desk representative is available Monday – Friday 8:30AM to 4:30PM Central Standard time. Call 1-800-225-1452. Use our handy Contact Us email form 24 hours a day and receive an answer via email, the next business day. There are over 250,000 I/T business products in your on-line catalog with live availability, negotiated pricing, and digital pictures. Print detailed specification with pictures and product overviews from your on-line catalog. Your on-line catalog features side-by-side product comparison technology allowing you to quickly browse for products and compare them side-by-side, spec-by-spec and price-by-price with a simple click of the mouse. Quickly view the number of pending orders, current items in your shopping cart, and quotes that are on your order status tab. Create your own list of favorite products to immediately add items to your Shopping Cart, keep frequently requested items easily accessible, and quickly locate those hard to find items. Once your account is set up and you have received your password, you can log in and personalize your account. Edit your profile, e-mail & company address, phone #’s and more! You can use the field to the left of the Expert Search icon to conduct a keyword search for the product you are looking for. The more specific your keyword search is, the more specific your search results will be. The Products tab is divided into product categories. 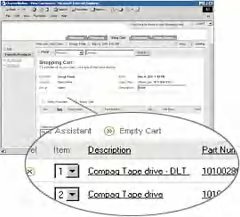 This allows you to quickly locate the product you need by simply clicking on the category that the product falls under. Also from the products tab you can choose to search by manufactures. If the application cannot find your product based on the keywords you provided, you may see the Additional Search page. This page will assist in your search by providing drop-downs of additional search parameters that may help narrow your search. After performing a search or choosing a category that returns a large number of results, you will be able to narrow your search further by selecting from the drop-down options next to certain product category attributes. Comparing products enables you to choose the product that best fits your needs. First perform a product search and then check the box next to each item you wish to compare. The Product Overview contains a summary of key information about a specific product. The Shopping catalog contains over 250,000 products available with complete data sheets. From the Product Overview page you can view the complete specifications for the item by clicking on the Specifications link or the Complete Specs link. This will enable you to view all the technical specifications available for this particular item. From the Product Overview page, the Related Items link will allow you to view a list of additional products that are compatible with a product line, such as additional memory or carrying cases. After selecting a Product from the catalog, click on Add to Cart to add that item to your shopping cart. The Shopping Cart can be saved as a Quote for your sales rep to review or can be converted to an order. You also have the option to e-mail this quote to someone within your organization (your sales rep will automatically be notified via e-mail when an order is placed), print this quote for your records, or continue shopping. The Sales Assistant is a great way to communicate with your sales rep. This feature enables you to type in a question for your sales rep and the sales rep can assist you in building a quote using your requests. View live order status. Search by P.O. number, order number, quote number or date of purchase. Once you are satisfied with the contents of your shopping cart, you can finalize your order by going to Checkout. The Checkout is a 4-step process: Billing and Shipping, Order Options, Review Order, and Terms and Conditions. After initially logging into the application, the first screen you will see is the Dashboard. The Dashboard enables you to view the number of pending orders, current items in your shopping cart, and quotes that are on your order status tab. Once your account has been set up in the database by your sales rep and you have received your password, you can log into the application and personalize your account. Begin by clicking on My Account located on the left-hand side of the My Channel tab. Here it is possible to edit your account profile. The My Account section enables you to change your e-mail address, company address, phone number, password, and time zone you are located in. To do this, click first on My Account, and then Edit at the bottom left-hand corner of the screen. You can begin locating products to add to your Shopping Cart from the initial Product Search screen as shown below. This screen has two sections: Expert Search and Category Search. You can use the field to the left of the Expert Search icon to conduct a keyword search for the product you are looking for. The more specific your keyword search is, the more specific your search results will be. After entering your desired keyword, click on the Expert Search icon to start the search. The initial product screen is divided into categories as shown above. This allows you to quickly locate the product you need by simply clicking on the category that the product falls under. If you would like to find which categories of products fall under the bold headings such as, Systems, click on that category heading and the list will appear. At the end of each category header there is a number in parenthesis which displays the number of search results in that category. If the application cannot find your product based on the keywords you provided, you may see the Additional Search page shown below. This page will assist in your search by providing drop-downs of additional search parameters that may help narrow your search. After performing a search or choosing a category that returns a large number of results, you will be able to narrow your search further by selecting from the drop-down options next to certain product category attributes. To add the desired item to the current shopping cart you are building, click on Add to Cart to the right of the item. You can also add this item to your Favorites list by clicking on Add to Favorites to the left of the item. The figure below shows the Comparison Results page. Comparing products enables you to choose the product that best fits your needs. In order to compare items, you must first perform a product search and then check the box next to each item you wish to compare. Finally, click on the Compare icon located above the Add to Favorites column. This will create a side-by-side comparison table, highlighting in red the differences between each. If you would like to drill see further information for any of the items, click on the manufacturer’s part number located beneath the product image. From the Product Overview page you can view the complete specifications for the item by clicking on the Specifications link or the Complete Specs link. This will enable you to view all the technical specifications available for this particular item. Both the Product Overview page and the Specifications page can be e-mailed directly from the application by clicking on the E-mail Specs Icon. The product pages can be sent in two formats– as an HTML or PDF attachment. You may also modify the message that accompanies your e-mail. When you are ready to send the e-mail, click on the Send icon at the bottom left-hand corner. From the Product Overview page, the Related Items link will allow you to view a list of additional products that are compatible with a product line, such as additional memory or carrying cases. You may also add any of these items to your current shopping cart by clicking on Add to Cart at right. They can also be added to your Favorite Products list by clicking on Add to Favorites at left. If you would like to view more detailed information about these items, click on the underlined short description to get to the Product Overview page. Below is a screenshot of the shopping cart. After selecting a Product from the catalog, click on Add to Cart to add that item to your shopping cart. The Sales Assistant is a great way to communicate with your sales rep. This feature enables you to type in a question for your sales rep and the sales rep can assist you in building a quote using your requests. If you would like to refer to information from your existing cart, click on the “Reference the current cart for the sale person’s review” checkbox. By clicking on the Order Status tab, you are able to view all current or past quotes and orders, built by either you or your sales rep. If you would like to review one of these quotes or orders, click on the document number under the View column and open that quote or order. Once you are satisfied with the contents of your shopping cart, you can finalize your order by going to Checkout. Billing and Shipping asks you to select the location for invoice billing and for product shipment. The billing address should always remain the same for each company, but the shipping address can be changed to accommodate multiple locations. Under Order Options, you will be asked to indicate your desired payment and delivery options. Review Order allows you to view the quote before it formally becomes an order. Lastly, the Terms and Conditions section enables you to review and accept the terms of the company’s purchase agreement. A confirmation will be sent to confirm the order has been placed in the system. Your sales rep will also be alerted to finalize the order process. The Print Preview icon beneath the Terms and Conditions allows you to view what the printed quote/order will look like. This web site is a service of M&A Technology, Inc.